Are you just getting started on your debt free journey? Do you feel overwhelmed with tracking all of your bills, balances, and interest rates? 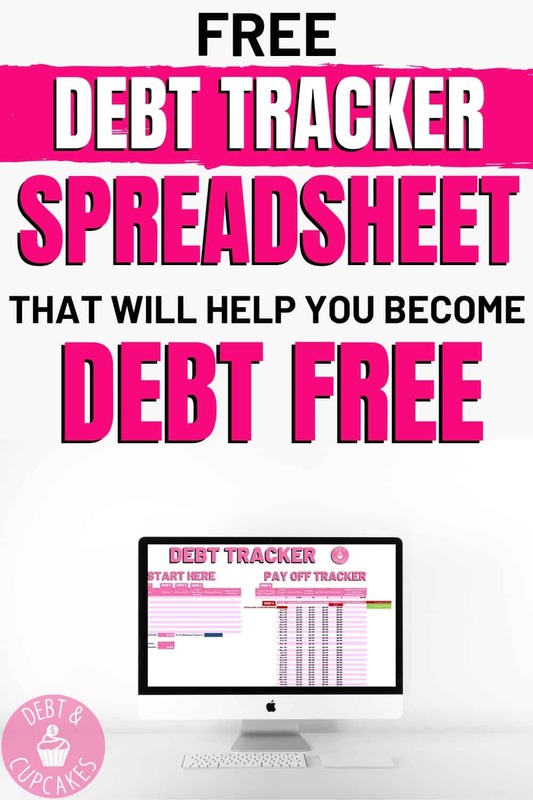 A debt tracker spreadsheet is an incredibly powerful tool that you absolutely must utilize whether you’re beginning or in the midst of your debt free journey. Making financial decisions without seeing the consequences is nearly impossible and the risk of making the wrong decision is extremely high. A debt tracker spreadsheet allows you to visualize your balances, interest rates, the total amount of interest you’ll pay over the life of a loan, and most importantly… your debt free date. Download Your Free Debt Tracker Spreadsheet Below! If I could go back to the day we first started paying off out $109,000 debt, I would smack myself upside the head and say “you need to plan and track this”! The first step in becoming debt free is planning your attack. Without a plan, your journal will be marred in agonizing defeat, wasted time, and money. I often wonder how many months, or even years we wasted blindly meandering through our pay off plan. After a number of failed attempts at debt freedom, we began to utilize a debt tracker spreadsheet. I organized our bills, calculated balances and interest rates, and began to attack our debt with an incredibly high level of motivation and confidence. Knowing our extra payments carved off months of time and interest pushed us to tighten the budget further and increase our payment momentum. Paying off debt is brutal. It’s a tedious process that’s been glamorized by financial gurus who buy yachts with the income off of their book sales. Don’t get me wrong… paying off debt is a necessary process. To gain control of your financial life and stop living paycheck to paycheck, you must become debt free. If you’re anything like we were, you have a lot of bills. They all have different balances, interest rates and minimum payments. How the heck do you keep track of all of that?! This free debt tracker spreadsheet will help you organize the financial chaos! You can document all of your loan information and keep it stored in one place for easy reference. Contrary to what the big gurus will tell you, there isn’t one perfect way to pay off your debt. The debt snowball and the debt avalanche are the most common methods, but how do you know which is right for you? A debt tracker spreadsheet will help you visualize your finances. You’ll be able to make the best financial decision based on the facts of your financial life! Maybe the snowball will be right for you, or you’ll find you can save a lot of money by choosing the avalanche method. Without seeing your actual numbers, you’ll only be guessing. Like I said earlier… paying off debt can take a long time. It’s boring, tedious, and mentally exhausting. Fear not, the end product will make those feelings quickly disappear. This free debt tracker spreadsheet will help keep you motivated by knowing the exact month you’ll pay off each loan! When you increase your principal payments on the spreadsheet you’ll see a number of things happen. First, you’ll see your debt free date change and you’ll see your total interest paid drop. The motivation you’ll receive when you watch your savings increase will push you to finish your debt pay off plan. The debt tracker spreadsheet might appear overwhelming at first, but it’s actually really easy to use! Aside from the ease of use, it’s packed with powerful tools to help you crush your debt as quickly and intelligently as possible! Simply follow the steps. Enter your debt name, remaining balance, interest rate, and the remaining years on the loan. Then, simply let excel do its thing! Easy-Peasy! You don’t have to worry about the order you put your debt in. You can take care of that later. Simply enter all of your debts/loans and move on. The sheet can take 15 accounts. The next step is to determine the order in which you’ll pay off your debt. Will you attack it via the debt snowball, debt avalanche, or a combination of the two? A really cool feature of the debt tracker spreadsheet is that it calculates how much interest you’ll pay over the life of the loan if you only made minimum payments. Now, how do you want to attack your debt? Your debt pay off schedule is up to you. The free debt tracker spreadsheet simply provides you with information to make an informed decision. If you’re not familiar with the debt snowball or the debt avalanche, here’s a crash course. The debt snowball is all about emotional wins and maintaining motivation. The debt avalanche is about saving money. By paying off your highest interest rates, you’ll avoid losing money in the long run. The debt tracking spreadsheet won’t make that decision for you, but it will provide you with the information you need to make an intelligent decision. Once you’ve decided which debt to attack first, you’ll need to figure out how much money you have available to knock it out. Luckily, the debt tracker spreadsheet will help you out. As you can see above, you have $43,5000 in debt. This equals $879.92 in monthly minimum payments. Luckily, you’ve nailed your budget and have a total of $1,500 to put toward debt. NOTE: You’ll need to manually enter an amount in the “Total Payments” cell as noted above. The debt tracker spreadsheet will do the rest. 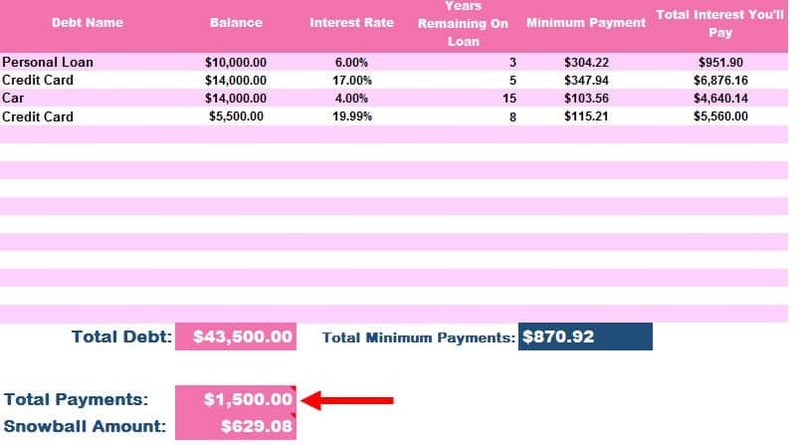 After all of your minimum payments, you’ll have $629.08 to pay toward whichever debt you’re currently attacking. As you pay off debt, this snowball will grow and you’ll make quick work out of your debt. Once you’ve decided which debt you’re going to pay off first, or next… you’ll need to add that debt to the Pay Off Tracker section. Don’t worry, it’s really easy! All you have to do is select the debt name from the drop down box! Bingo! The debt tracker spreadsheet will do the rest! After you choose which debt you’re going to pay off, you’ll notice that the debt tracker auto-populates a lot of additional information. Don’t fret, it’s supposed to do that! Note: If your loans are compounded daily, you’ll need to change the “Periods Per Year” to 365. Otherwise, no changes are needed! Once you select your debt and add in the starting month/year, the debt tracker spreadsheet will create an amortization table for you (see above)! Each month, you’ll need to add in your extra payments to the debt tracking spreadsheet. It’s super easy and oddly satisfying… Don’t judge me, you’ll soon understand! In the column titled extra payments (column N), you’ll add in your snowball payment from B25 each month you make additional payments on your principal. Note: Be sure you let your lender know that you’re making an extra payment on the principal balance of your loan. Some lenders may not put your additional payment toward principal if you don’t instruct them to do so, and this will significantly delay your debt freedom! A bonus feature of the tracker: As you add in extra monthly payments, you’ll see your debt free date change and also how much money you’ve saved in interest! Keep paying extra and watch that beautiful green number grow!! Note: Any time you see a small red marker in the top right corner of a cell, there is a comment in that cell. Simply hover your cursor over the cell and read the definition. Well… there it is. A quick and dirty break down of this powerful debt tracking tool. It doesn’t matter how you’re attacking your debt, just that you’re working toward debt free living. Don’t spend your life like 70% of American’s worried about debt. You can become financially independent, but first you must become debt free! 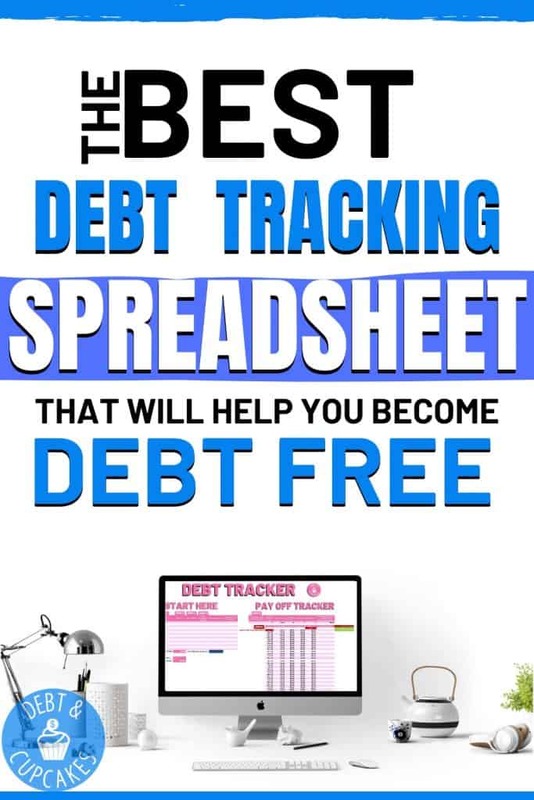 Use this free debt tracking tool to help remain organized and motivated during what can be a long and tedious process! Let us know how your debt free journey is going in the comments! If you run into any problems or have questions about the spreadsheet, shoot me an email at Brent (at) Debtandcupcakes (dot) com.